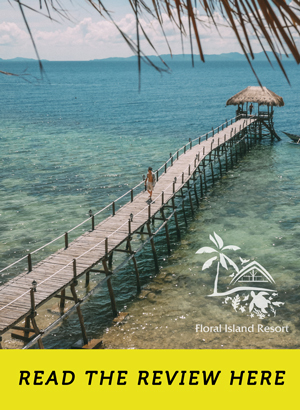 There are restaurants—places you go to when you’re hungry—and then there are destination restaurants, places that serve meals worthy of traveling for. 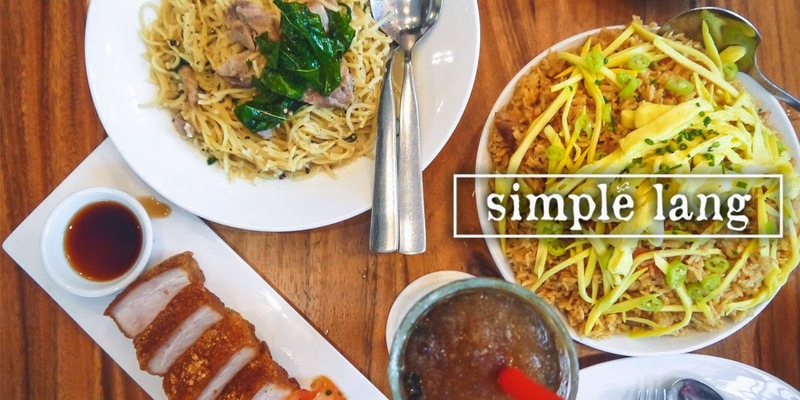 These are the cafés, diners, or fine dining establishments you would endure hours of traffic for, because you need to satiate your craving for that delicious steak, or that signature pasta dish. These are the restaurants more exciting at times than the town or city it is in, and yes, sometimes they are the destinations themselves. Taza Fresh Table in Taal Vista Hotel is such a restaurant. 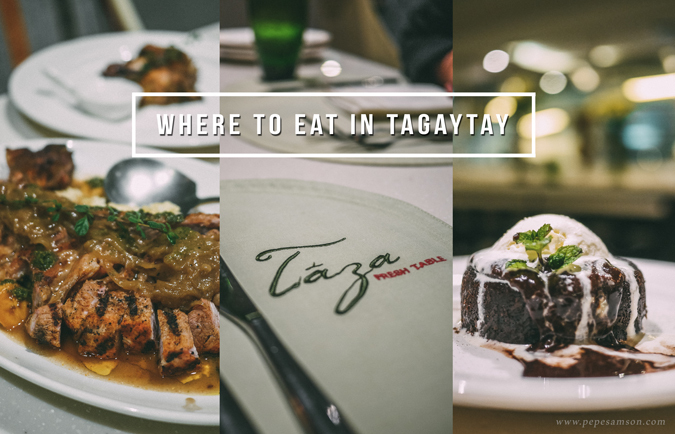 Tucked inside one of the most expansive hotel properties in Tagaytay, Taza lures diners—locals and visitors alike—with its luscious farm-to-table offerings. 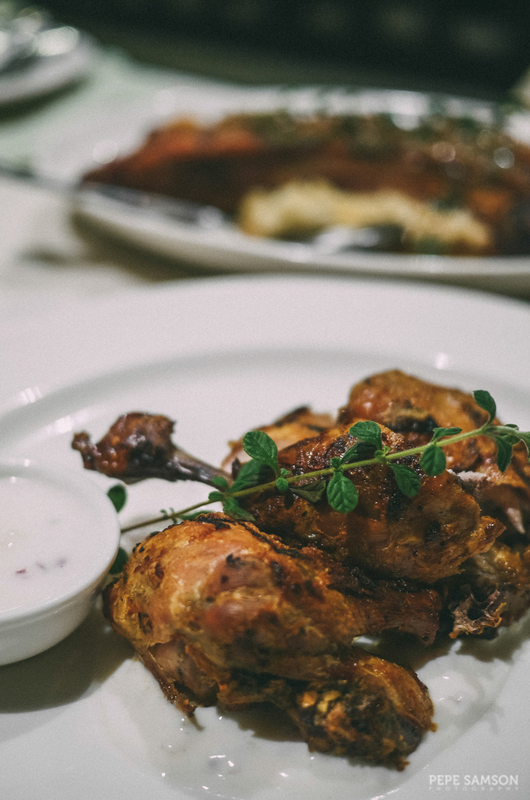 With ingredients sourced from different regions of the country, all dishes are fresh, handmade, and prepared right inside their kitchen. 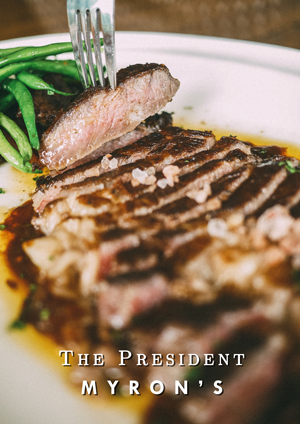 No shortcuts—meats are slow-cooked and sauces are made from scratch! I love Mediterranean food, and Taza’s mezze selection blew me away. 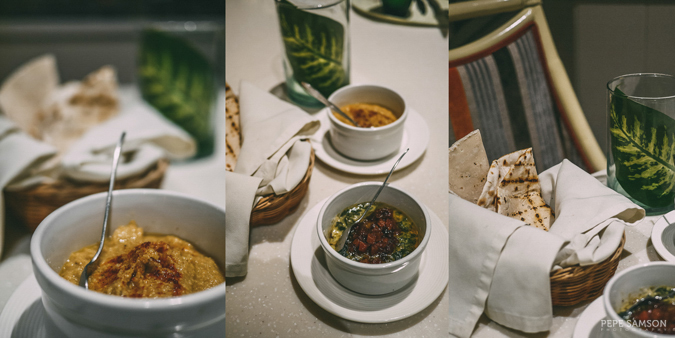 The Hummus (PhP200) was incredibly good—one of the best I’ve had, to be honest—and the Spinach with Bacon Jam (PhP200) combines salty, sweet, and creamy into one amazing dip. And don’t get me started on the flatbread—served warm (freshly made, of course), it had a delightful chewiness that I enjoyed so much. Tagaytay can be quite chilly (especially when it rains, which is exactly what happened when we went) and what better way to comfort your tummy than filling it with some hearty soup. 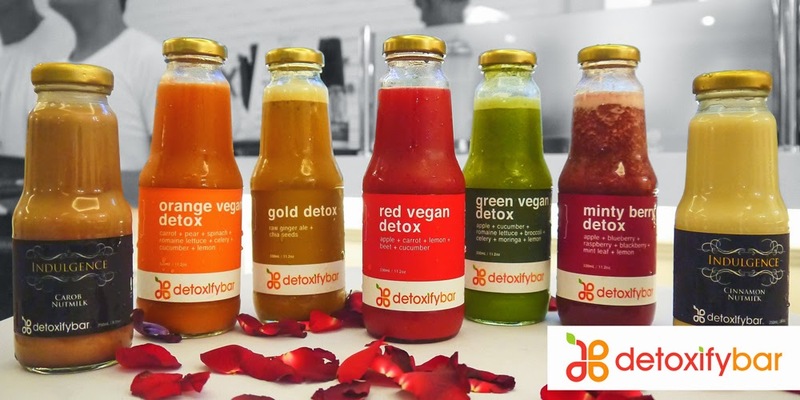 The Cream of Kale and Spinach Soup (PhP270) is not only uplifting but also healthy. 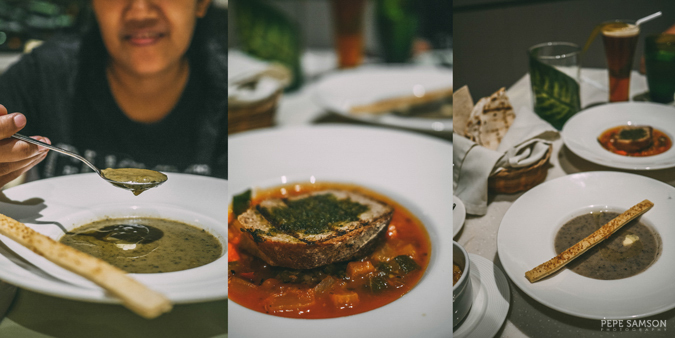 If you like sour soups like minestrone or ratatouille, get the Ribolita (PhP250), which is part of their Seasonal Menu. It’s made of an assortment of vegetables, a tomato base, and some white beans, then served with wheat bread. My favorite, however, was the Mushroom Soup (PhP290) composed of oyster, shiitake, and button mushrooms—yum! 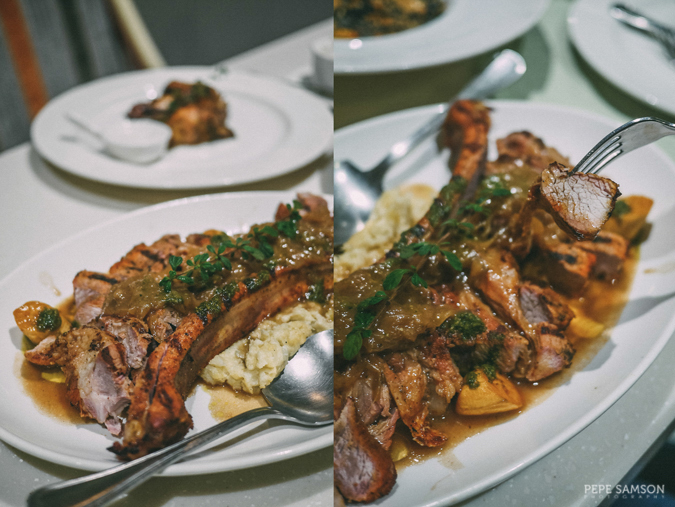 When you dine, make sure you bring some friends or your family and then order the Tomahawk Porkchop (PhP800)—a humongous bone-in pork chop topped with caramelized onions and pork jus, with some bananas and cauliflower mash on the side. Everything about this dish was astonishing. 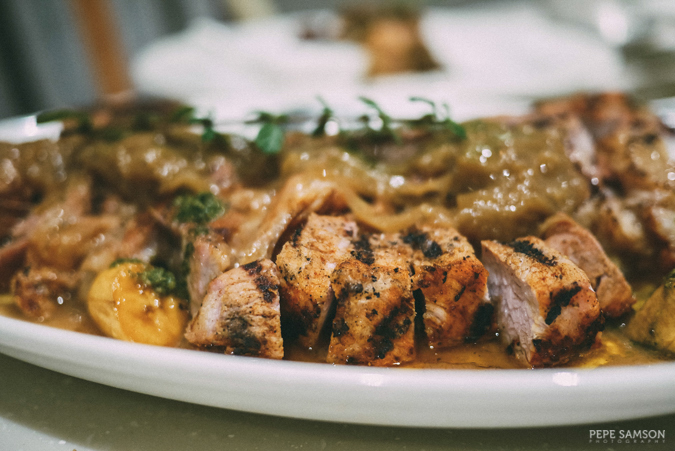 The pork is smoky, perfectly tender, and flavorful; the sauce doesn’t overwhelm and enhances the pork instead; and the sides—man, I loved those bananas and cauli mash! 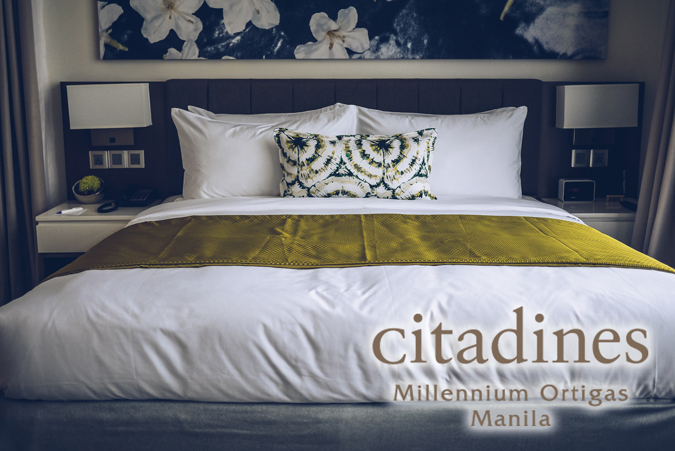 This alone is worth the 4-hour drive from Manila to Tagaytay! The Grilled Turmeric Chicken (PhP550) wasn’t bad—but honestly, I was so engrossed with the pork chop that I barely touched the chicken (sue me!). The yogurt and tzatziki balance out the turmeric and ginger flavors, but the real standout was the coconut rice it comes with—so good! 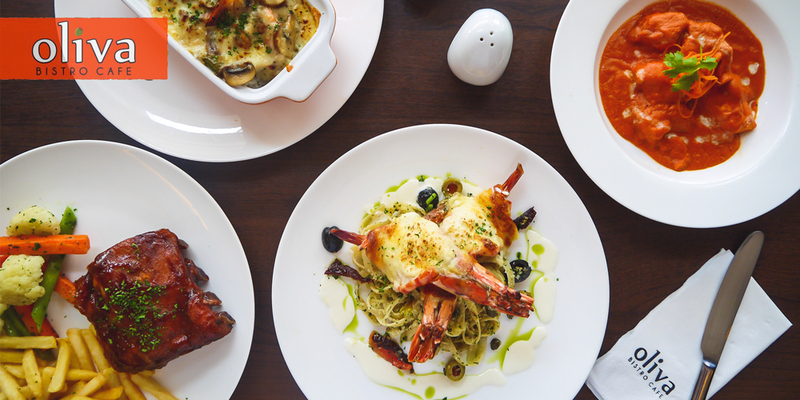 Taza also has a selection of must-try freshly-made pasta dishes. Excited as I was though to try them all, I went for the Uni Pasta (PhP575), also part of their Seasonal Menu. If you love uni and you are endlessly craving for it, you have to order this dish. 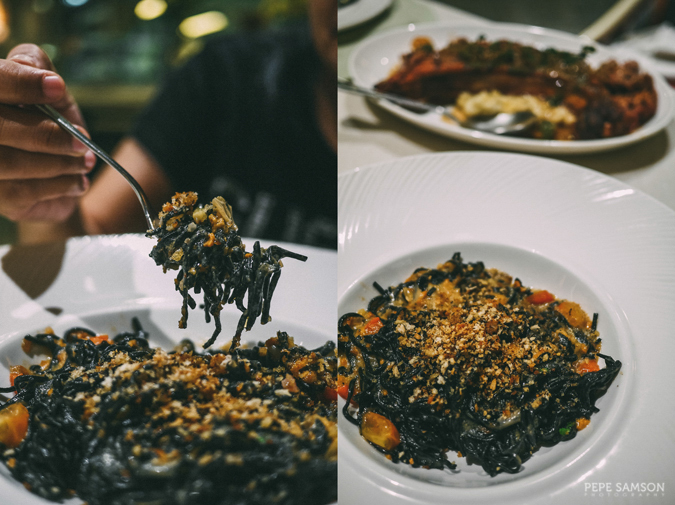 Made with Pangasinan sea urchin and squid ink spaghetti, the dish is an exquisite creation. Admittedly, uni is not for everyone but those who have tried it (and liked it) would surely enjoy this dish (my aunt has never eaten uni—she loved this pasta). End you meal with some desserts—and believe me, Taza’s lineup are worth the calories. 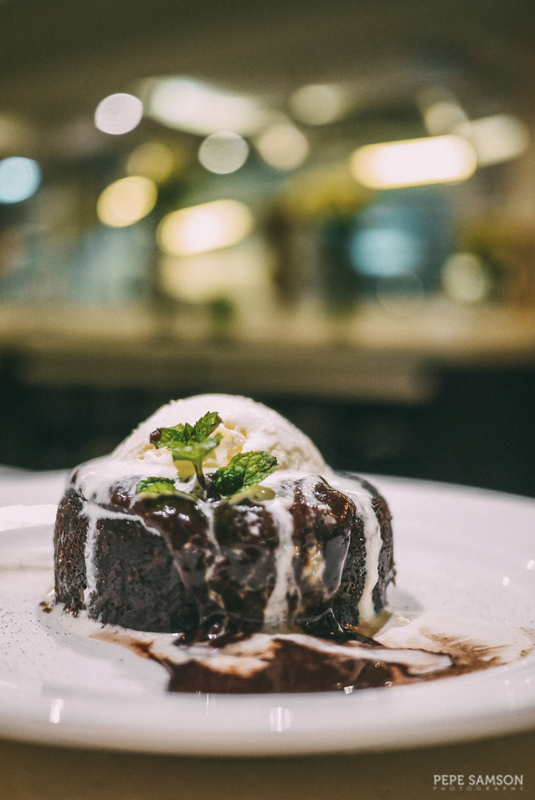 For lovers of chocolate, try the Molten Chocolate Cake (PhP225)—a lava cake filled with Alfonso tablea (from Cavite) and topped with queso de bola ice cream. So rich and evil!!! I found this too sweet though. 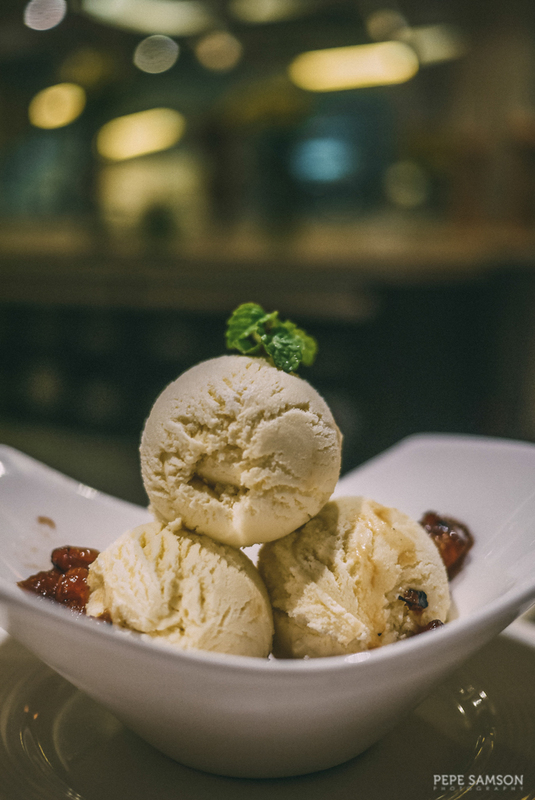 My pick would be Taza’s signature Olive Oil Ice Cream (PhP215)—yes, olive oil! I’m adding this to my growing list of weird ice cream flavors along with tilapia ice cream. But this one was so subtle, and just when you thought it’s all olive oil, your tongue would stumble into some glazed pineapples—and every time it does, jolts of excitement shoot up my spine. SO GOOD. I want a whole tub of this for myself. Taza’s menu is pretty compact so diners wouldn’t have a hard time choosing what to try. 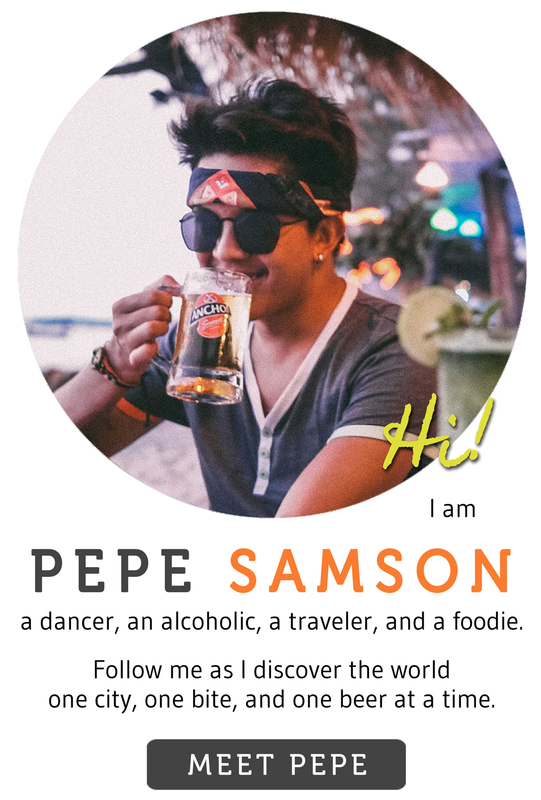 I already have my eyes set on what to try when I go back there—hi, Moroccan Chicken, Bukidnon Wagyu, and Lobster Fettucine—and really I can’t wait to be surprised once more. 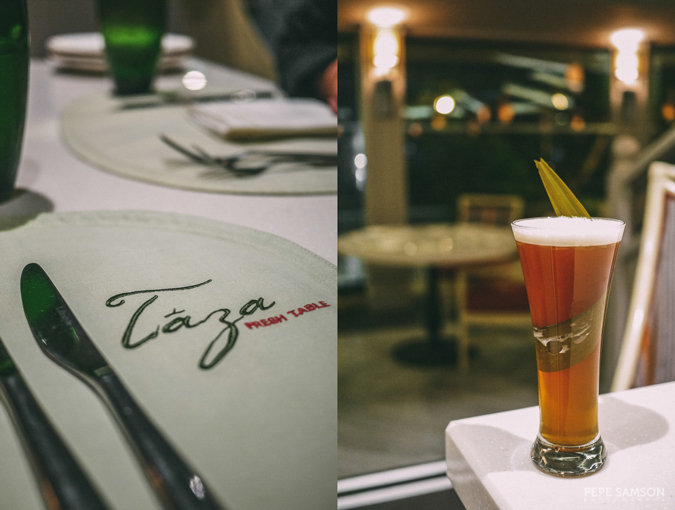 The next time you find yourself in Tagaytay, pop into Taza Fresh Table and sample a variety of scrumptious, well-thought-of dishes. 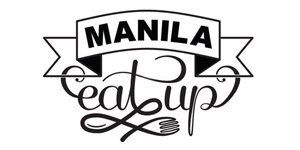 The ingredients may come from different parts of the Philippines, but Taza’s flavors will take you around the world. 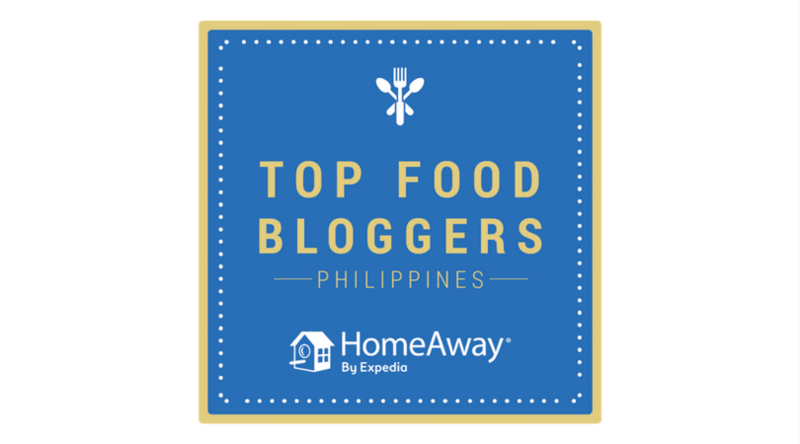 What is your favorite Tagaytay restaurant? Have you been to Taza Fresh Table?